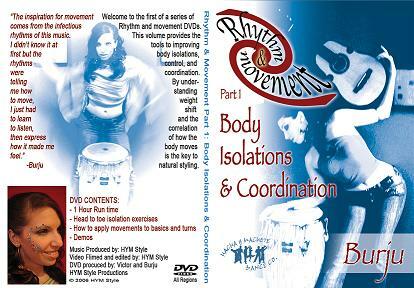 Here are the rapidshare links of Burju's Body Isolations and Coordination DVD in VCD format. Welcome to Our world of Rhythm and movement! This DVD will help you master the body isolation, control, weight shift, enhance your styling and improve your co-ordination. Our inspiration comes from infectious rhythams of salsa. We believe that the rhythm itself tells you how to move and we'll show you how to listen to it! The DVD is presented by Burju and has three sections. The first part gives body isolation exercises. The second part shows how you can combine those isolations to styling moves and use them with the basic step. In the last part, she gives you a sort of shines choreographed to two pieces of music (available on separate CD), picking out the rhythms played on different instruments used in the music. This last part is quite challenging but very interesting. Excellent DVD..it covers body movement, styling, musicality..and most of the movements can be used as shines. All the movements are broken down clearly. Starts easy and becomes really challenging. This is a MUST HAVE DVD for ladies. Guys would also find it beneficial - esp to improve body movement...Learning to incorporate ur entire body in ur dancing and shines. sorry but i can not find in rapitshare the BURJU part1-part8 ????WHY?????????????? » CHÂU BODY LÂM BENH.